How do you choose the best table for your spa needs? Flat Tops Ideal for massage therapy and spa services that do not require the client’s head or legs to be elevated. In cases where elevation is needed, bolsters are used to achieve the client’s desired level of comfort and support. 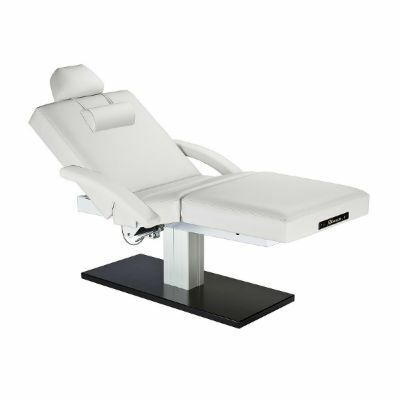 Tilt Tops Perfect for massage therapy and skincare services, such as facial treatments. These tilt models can be positioned completely flat if desired. Salon Tops These units have the ideal combination of features to provide therapists with ultimate versatility, while delivering maximum client comfort. The head and leg sections can be adjusted independently to suit each client’s unique needs. How Much Storage do you Need? If you have ample storage in your treatment room and would rather maximize client access during treatment, opt for a trestle base table. This unique design gives the therapist closer access by allowing him or her to have their knees underneath the table while in a seated position. Shelf base models are convenient for storing extra bolsters or treatment tools, and can easily be concealed beneath a draped sheet or blanket. The ultimate storage opportunities are available in cabinet base models. Depending on the cabinet capacities, some models can even house a small towel cabi, in addition to extra sheets, face rest covers and other tools. Newer models even have integrated towel warmers built into the cabinet structure! Manual Tilt or Power Assist: What’s the difference? You may see terms like “Power Assist” or “Pneumatic” listed on several units throughout the site. The difference between these mechanisms and a traditional “manual” system is very simple. Power Assist is accomplished with the push of a small lever on the back or leg portions of the table, allowing the therapist to make modifications to the back recline or foot elevation while the client is on the table. This mechanism is similar to hydraulic office or barber chairs. Some models have a hand crank at the base of the table instead to allow for easy adjustments as well without requiring the client to get off the table. Fully manual models have a small bar on the back or underside of the table, similar to lawn or pool side chairs. Ideally, these manual adjustments should be done prior to the client getting on the table. Other manual models have knobs on each of the table legs that can be manipulated depending on the table height desired.